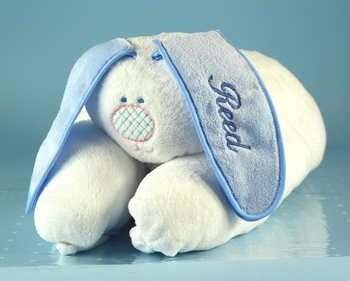 This cute creation is a super soft baby receiving blanket in the shape of a little blue bunny rabbit! The blanket measures a generous 30 by 36 inches. The bunny ears, soft and floppy and embroidered with baby's name. In addition, a large terry velour bib is also embroidered with their name making this a truly unique gift idea for any new baby boy!